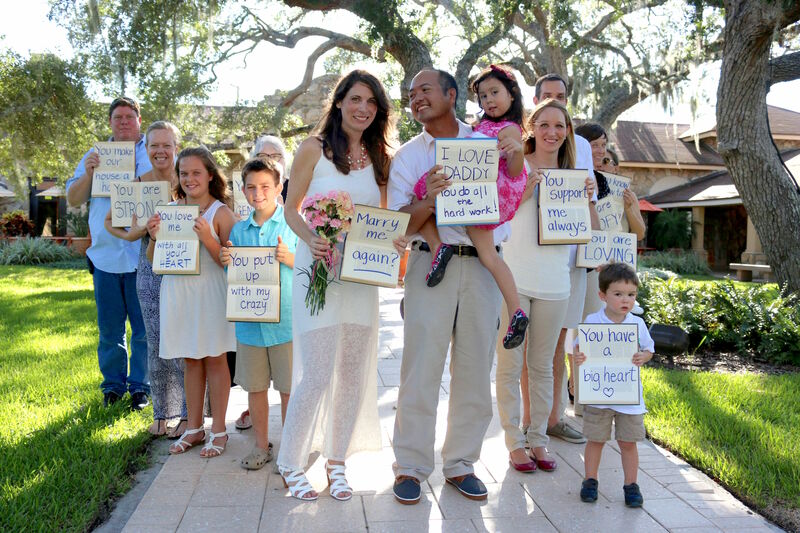 For the last feature of our Bookworm Bytes series, we head to Florida and listen to the story of Michelle Lee -an English professor who proposed to her husband of 20 years and renewed their vows with family, friends and BOOKS as witnesses. But, what happens when you add in 20 years of marriage, the 24th anniversary of the professors’ first date, and a crazy conversation in a parking lot between an English professor and a colleague? As a person who always searches for ways to change amidst the same schedule day-in and day-out, I was intrigued when my colleague, an English professor who moonlights as a notary public and a wedding coordinator, suggested my husband Charles and I renew our vows. It just so happened that the anniversary of our first date was in seven days. And my colleague was part of a new venture called Daytona Flash Weddings. Could we pull it off, without Charles knowing? First – a concept. 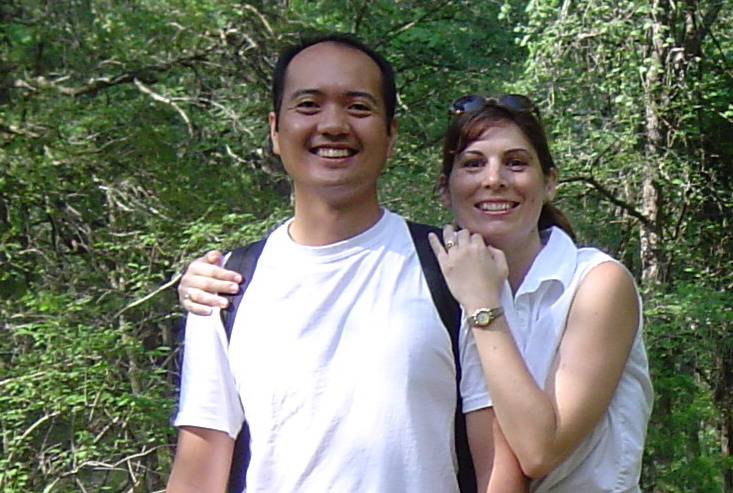 I tried to think about how to best express my love and gratitude for this man who I have been with for more than half my life. Immediately, as a creative writer, I thought of poetry, of bold beautiful sentences held up by our friends and family for him to see, words that would capture who he is. I thought of posters, but didn’t want the feeling of a second-grade research project. Then, I walked through our college library and saw the tables and bookshelves of free, out-of-date, falling-apart books. These were books no one wanted anymore. Books on German philosophers written in 1964. Books on obscure British poets. Books on South American fiction writers. Books with wonderful cloth covers, stiff white paper. Books that had weight. These books suddenly became possible canvasses. I snagged one, squirreled it away to my office, took out a Sharpie. I let the book fall open, found its natural break. I wrote on the pages: You make our house a home. I immediately thought of our close friends, greeting Charles with these loving messages, these books with such history. I imagined a path lined with books, all bearing words that meant so much. I scribbled book after book after book. You put up with my crazy. You are strong. 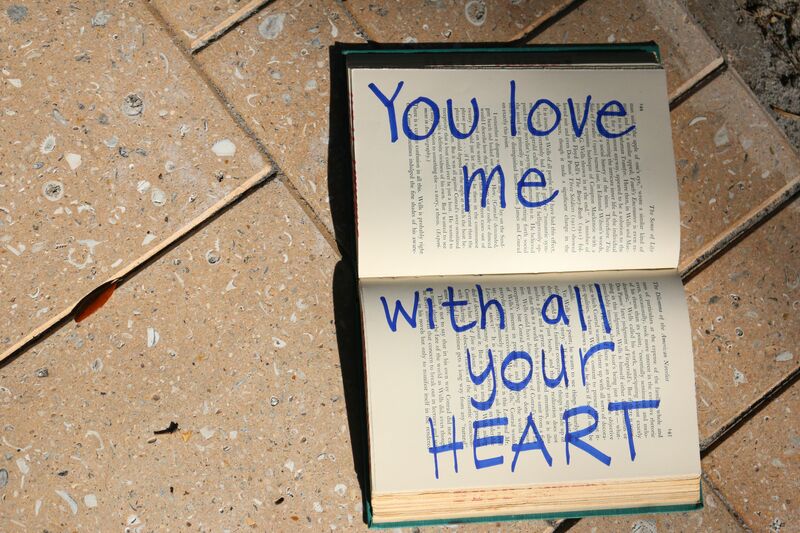 You love me with all your heart. The book I would hold: Marry me again? So I found a lyrical white dress, some fragrant pink and yellow carnations. I invited our dearest friends. I invited Charles the day of the wedding. When he arrived home, he found a map and an invitation tucked in a book, his clothes ironed and waiting. When he arrived at the Spanish-style plaza where we all had gathered, I led him down the path and read each book, in hands and on the path, aloud. You know how to fix everything. Transforming these worn books into poetry, into love, symbolized this moment of renewal for us. These words of appreciation, written palimpsestically, expressed this idea that evolution and commitment can exist, and even thrive, together. Renewing our vows became the ultimate in repurposing. I received my MA in creative writing and PhD in English Literature from the University of Texas at Austin. My writing has been published in a variety of academic and literary publications; most recently, my fiction has been published in The Citron Review. 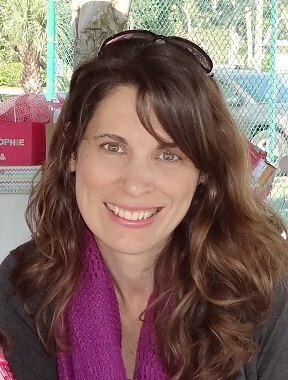 I am an Associate Professor of composition and creative writing at Daytona State College on the coast of Florida, I’m a mom & a wife, and I am trying to be more mindful of the wonderful, beautiful, creative things that flutter into my life. – Michelle Lee, Ph.D. So d o… as Michelle Lee does – be more mindful and grateful for the beautiful, creative things that flutter into your life. And celebrate the people you love! Brought tears to my eyes to read this and imagine the glory in this special day. I was visualizing Charles when he started reading the beautiful sentiments and just know his heart was bursting. So very sweet, my friend Michelle. You’ve always been such a loving jewel. It is so sweet and creative and simple way to express your grattitude for the one you love! Such a beautiful idea ! I’m amazed and Michelle Lee – you are great woman ! And your husband really – is a lucky man! 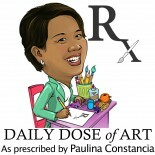 This entry was posted on November 28, 2014 by Paulina Constancia in Communicate, Imagine and tagged books, celebrations, family bonding, inspiring relationships.